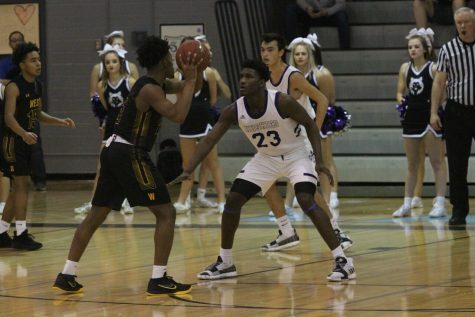 The varsity boys basketball team defeated Blue Valley West on Friday, Feb. 8 at BVW. Senior guard Christian Braun finished the game with a double-double and a game-high 23 points. The win pushes the Huskies record to 14-2 on the season and 5-1 in the EKL. 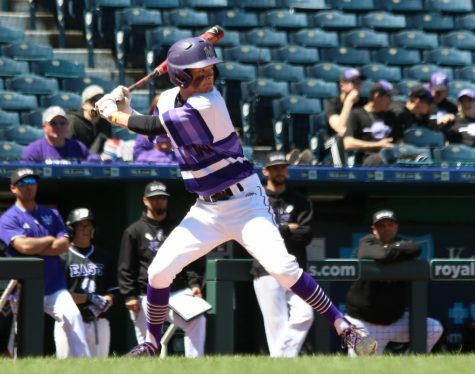 Senior Christian Braun drives in the game against Blue Valley West on Friday Feb. 8 at BVW. 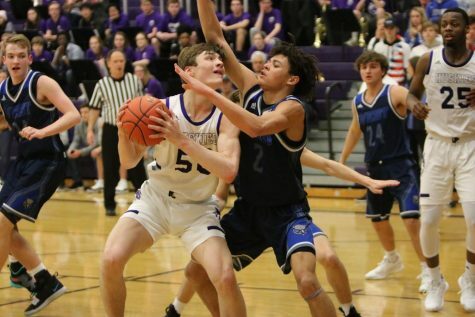 BVNW defeated BVW, 57-49. 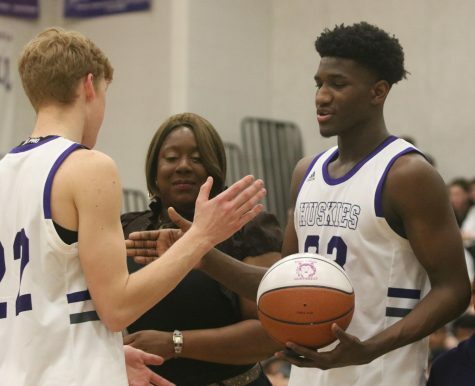 After falling to Bishop Miege on Tuesday night, the Huskies were unable to practice between the loss and Friday nights game with Blue Valley West, due to the cancellation of school and practices. Coach Ed Fritz attributed this to flat first half for the Huskies. Coupled with the inability to practice, Fritz said the zone utilized by the Jaguars for much of the first half also contributed to the Huskies’ difficulties in the first two quarters. 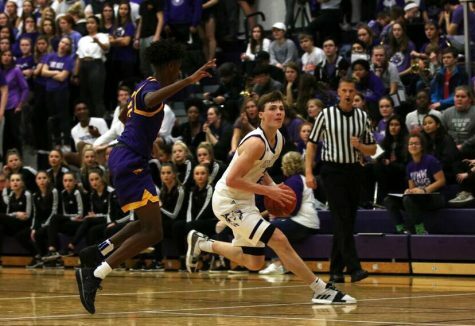 Coming out of halftime down a point, Fritz said in order to counter the zone, BVNW had to drive and kick to find the open shots. 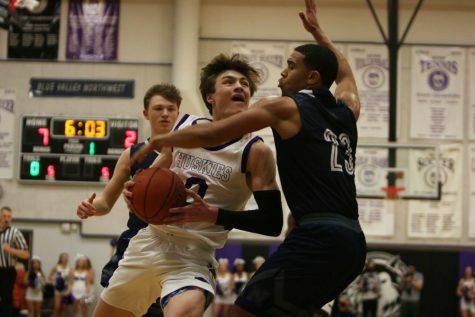 A big part of that, Fritz said, was the University of Kansas commit Christian Braun who finished with 23 points and 11 rebounds on the night. 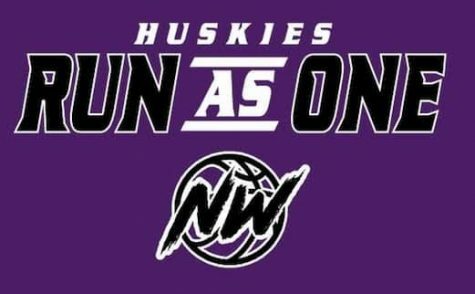 Agreeing with Fritz, Braun said the Huskies were able to execute better in the second half because of the adjustments made by the team. Despite this, Braun was also victim to the slow first half, not scoring his first field goal until the second quarter. 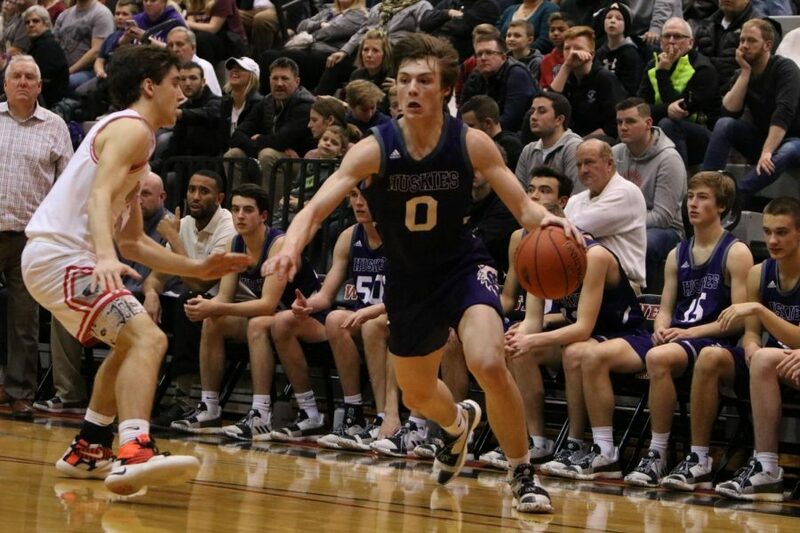 The Huskies are no stranger to playing down this year and quickly regained it in the third quarter. 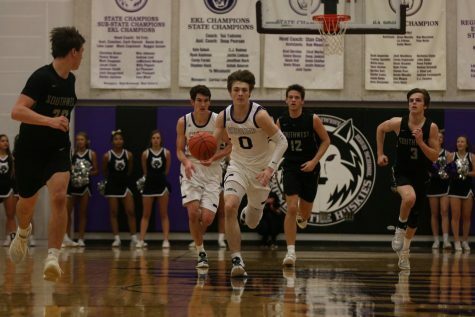 From there, the boys varsity basketball team never looked back, extending their lead in order to secure an eight point win. 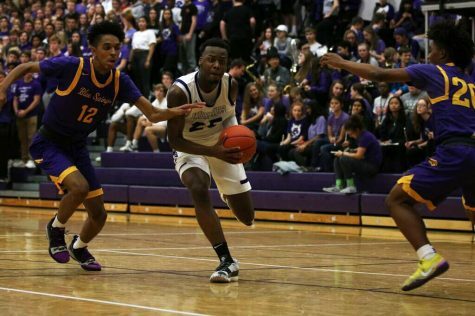 To officially put the game out of reach, senior Mike Peake added a cherry on top, throwing down an alley-oop late in the fourth quarter. Finishing with 13 points and 8 rebounds on the night, Peake said it felt natural to be receiving the lob pass to his dunk from fellow teammate Braun. “The chemistry that me and Christian have, we’ve had it for like three years, so it felt good to do that,” Peake said, referring to his alley-oop. After just their second loss of the season, Peake said the defeat didn’t phase him as he had confidence in his teammate and their team motto to move past it. “Are motto is always ‘Next play, next game,’” Peake said. 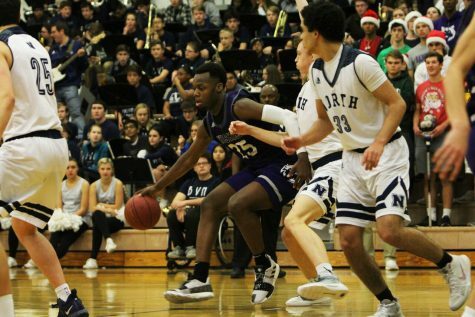 Following the win against Blue Valley West, the varsity basketball team will take on Soldan International Studies on Saturday Feb. 9 at 5:30 p.m at BVNW.